We offer a range of attractively packaged, quality truffle gifts. These are perfect gifts for the foodie in your life or to treat yourself. We have a truffle oil selection containing English truffle oil (English rapeseed oil and English black truffles) in addition to Black and White truffle oils made with Olive oil. 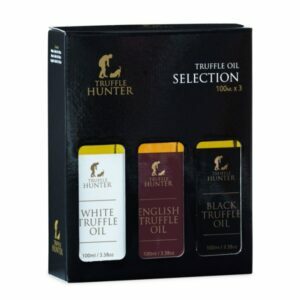 A truffle hamper contains these three truffle oils as well as Black truffle salt, White truffle honey, minced truffle and truffle carpaccio.